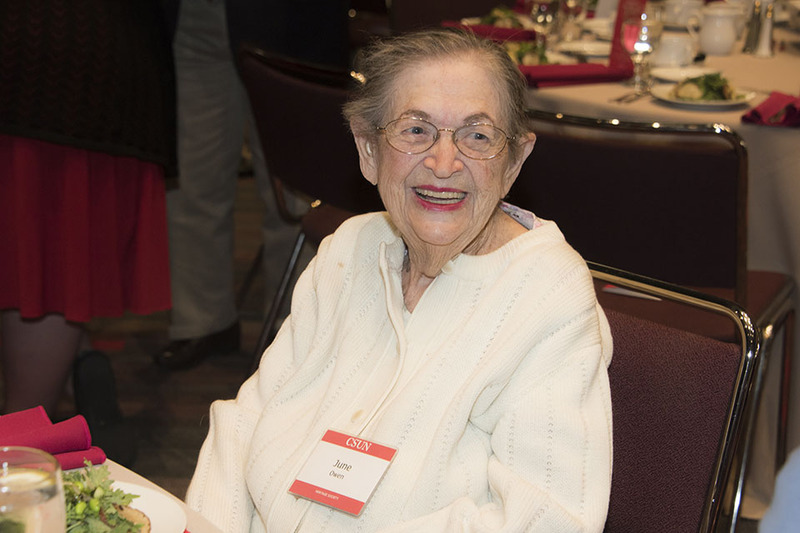 91-year-old June Owen at the 2017 Donor Appreciation Luncheon. Owen spent more than 30 years as a successful mathematician. Photo by Lee Choo. During the span of three decades, 91-year-old June Owen designed parts for the original Atlas missile, the first operational ballistic missile developed in the United States after World War II, worked on the math that determined the orbits of the satellites for the military GPS system as well as the calculations that helped guide the cruise missile. Owen last worked for and retired from Computer Sciences Corporation, where she was stationed on the Point Mugu Navy base located in Oxnard. Earlier in her career she had worked for other aerospace companies such as Convair (General Dynamics) in San Diego and North American Aviation in Downey — both firms have since merged with Boeing. Throughout her illustrious career, Owen has credited CSUN for helping her develop the tools to become a pioneer in the field. To show her appreciation, Owen will be donating a planned gift in her estate to the institution that she recognizes as having had a profound impact on her life. “I earned a living doing math, and CSUN is the place that gave me [the skills] how to do it,” Owen said. But it wasn’t easy because she decided to get into a field that was vastly dominated by men. Owen ’72 (Science and Mathematics) recalls being viewed differently, just because of her gender. To this day, she still has her transcripts from college and proudly produces a fact — she got straight A’s in her classes that semester, a workload that consisted of algebra and trigonometry, applied differential equations and three mathematical analysis courses. Owen credits one of her professors, David Ostroff, for pushing her to keep pursuing her degree. Professionally, Owen refused to get angry when male co-workers mistreated her. She recalls some who threw spit wads at her, and she said she was paid $10,000 per year less than her male counterparts. “I told my boss that he had to give me a place to work where people weren’t going to throw spit wads at me,” Owen said. Owen’s boss accommodated her wishes with an office to herself. As a result, Owen recalled solving a math calculation the company assigned her to solve that had stumped employees for more than 20 years. To this day, Owen still fondly looks back on her accomplishments and beams with pride knowing that she was at the forefront of women in the field of science and mathematics. She resides in West Hills and has a son, Jeff, and two grandchildren.